These two homes built in September 2011 are set in a large grass compound and provide an ideal, safe, loving and family environment for 24 orphans or abandoned children. Care for these precious children is provided by two wonderful live-in House Mothers who have cared for the children since the opening in 2011. Two Aunts and an Uncle also form part of this caring family. Our warden visits the children daily to engage with the children and to ensure maximum support is available to the staff at all times. To ensure the smooth running of the homes a local lady helps with the laundry which is undertaken by hand as there is no electricity on site and our night-time security guard ensures that the House Mothers and children feel safe at night. Our two homes are named Genesis & Hallelujah and these names reflect our Christian belief in God. 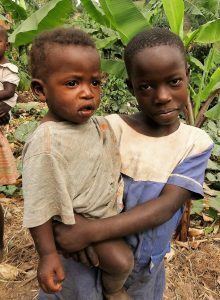 Each child has their own bed and belongings, although clothes do get passed down to the younger children when out grown as part of normal family sharing. All the children learn life skills according to their age, such as growing and cooking food, chopping wood, light cleaning and washing their clothes and dishes. They also learn how to make baskets and simple woven goods that could provide an income in the future when they become independent adults. Four resident goats and lots of chickens also give the children the opportunity to learn animal care. 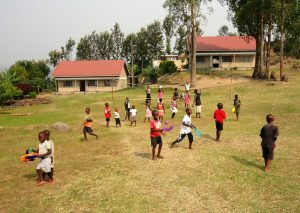 Visiting the Children’s Village is a wonderful experience, the children are eager to play, sing and dance and they are now a happy picture of health and energy. It is difficult to remember the terrible circumstances that these children previously came from and we thank God for the vision and resources to provide these homes.